It is two weeks before Pesach and I am already running to prepare. But, before my kitchen goes completely Chametz free I wanted to share this recipe with you. This little cookie, bar, or tart, I am not sure what to call it was the hit of all of the Purim Platicos or Mishloach Manot this year. 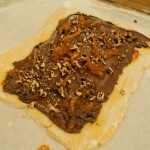 This recipe came to me as an inspiration when my friend Suzette and I baked her Italian Crostata di Marmelata last year. 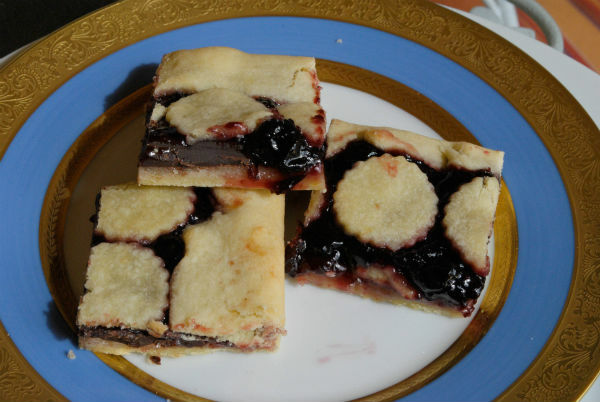 Using that recipe for dough, I layered a square tart pan with a removable bottom with dough, then, with marzipan, then dark chocolate and finally black cherry preserves. 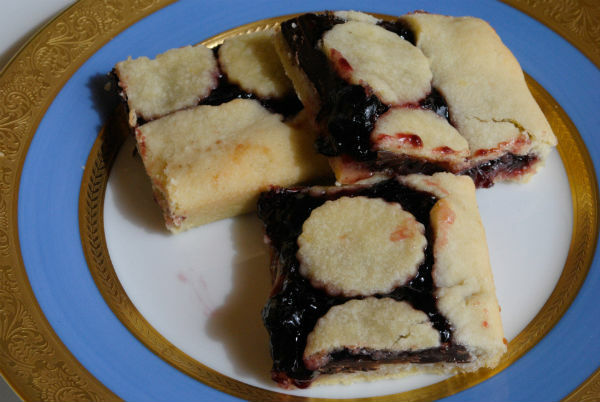 I froze that tart after baking and a month later when I defrosted it to use, I sliced it into bars or squares if you will. Guests at the party I made dairy for Sukkot, kept commenting saying they were delicious and what were they? 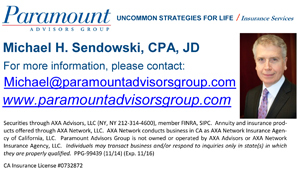 and wow….A surprise hit! That is when the recipe ended up on my Purim to do list. 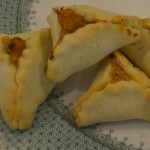 So in celebration for my sister Barbara’s birthday, I am posting this unique recipe and having one more bite of yummy Chametz before Passover. Happy Birthday Barbara. Measure flour and salt into a large bowl. 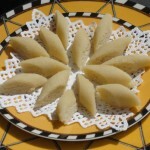 Cut room temperature butter into flour, until it is small pee size, sprinkle in lemon zest, and set aside. In a medium bowl, using a whisk, beat egg yolks, whole egg, vanilla, and sugar until very thick and light in color. Add lemon juice and combine. 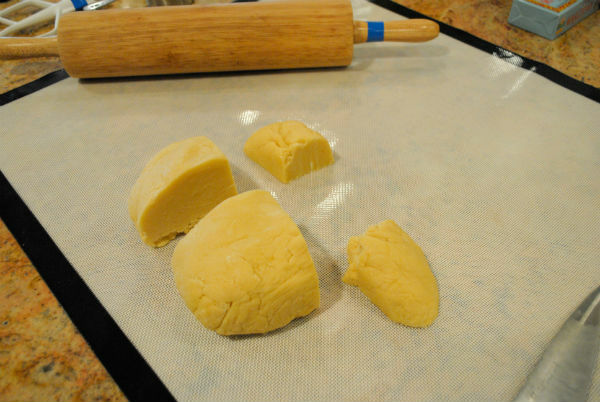 Pour eggs into flour mixture and use your hands to mix and pat quickly into a disc of dough. Do not knead. Wrap disc in plastic wrap. Refrigerate for two hours. After two hours, heat oven to 365°F, remove dough from refrigerator and sprinkle some extra flour on work surface. 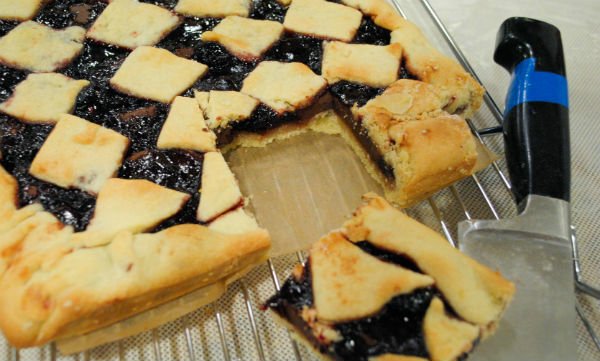 Cut dough in half. Divide first half into two parts about one third and two thirds. 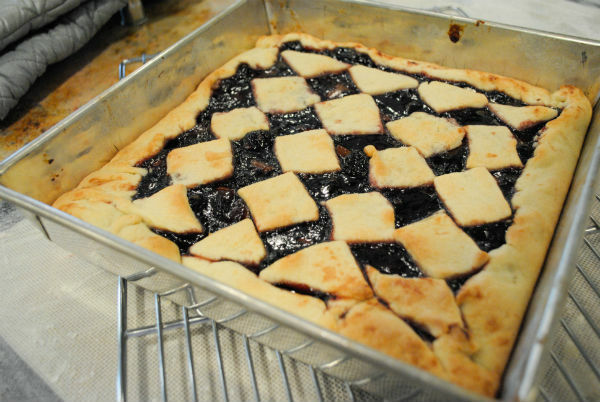 Take the two thirds piece and roll out evenly into a square large enough to fit 8 or 9 pan. Transfer dough to tart pan and fit into place. 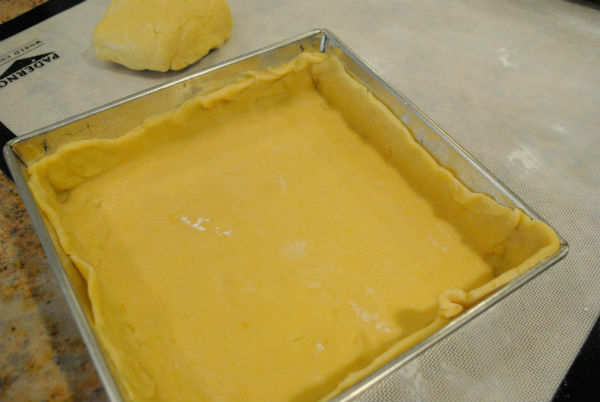 Roll out marzipan into a thin square to fit tart pan. Place in bottom of tart, or piece it and place in bottom as best you can. Break up chocolate bars into thin squares. 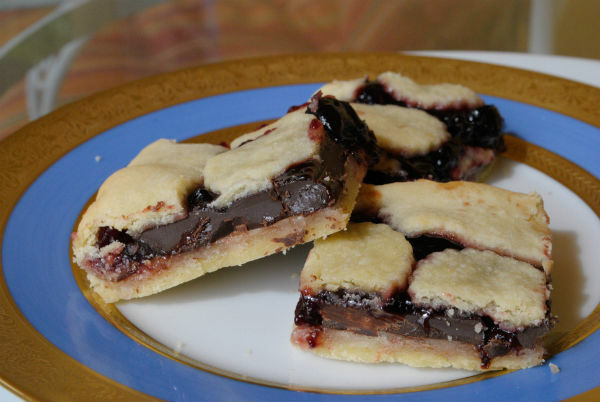 Scatter chocolate squares over bottom of tart on top of marzipan layer. 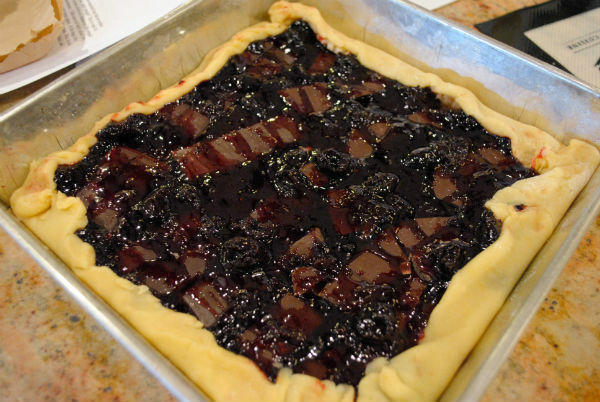 Cover this filling with a third layer of spoonfuls of black cherry preserves. Use back of a soup spoon to even out preserves, chocolate and marzipan filling by gently pressing. Roll remaining one third of dough out. 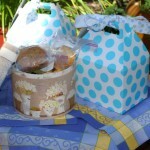 Using shape cutters, cut circles, rectangles, leaves or any shape you like to place on top of tart. Repeat rolling and layering with second half of tart dough. 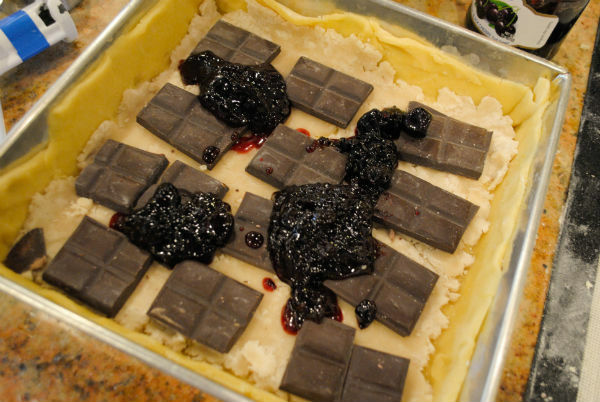 Place tart pan on a rimmed baking sheet to catch any drips and bake tart until golden and puffed about 25-35 minutes or until barely golden.